Gatlinburg is nestled at the entrance to Great Smoky Mountains National Park, the most visited national park in America. There are three entrances into the Smokies right from downtown. 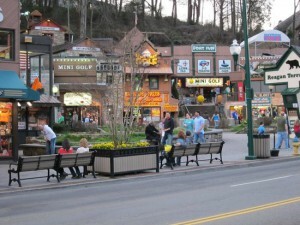 Gatlinburg attracts more than eleven million visitors a year and can grow to a population of 40,000-plus on any given night. This little town of 3,944 residents is dedicated to welcoming all of its guests with a taste of Appalachian hospitality at its best. Folks come from all over the world for vacations, outdoor adventures, family fun and memory making. Gatlinburg is one of America’s great mountain resort destinations, with accommodations of every kind, dozens of local-to-national restaurants, and attractions galore – all nestled in the foothills and surrounded on three sides by the natural beauty of the Great Smoky Mountains. Gatlinburg prides itself on its walkability amidst mountain heritage and the arts, crafts and shops that reflect that tradition. Anchored at the corner of East Parkway and Glades Road at Traffic Light #3A, you’ll find the beginning of the Great Smoky Arts & Crafts Community. Home to over 100 shops featuring craftspeople and artists along an 8-mile loop, it’s the largest gathering of independent artisans in North America. You’ll discover one-of-a-kind crafts, treasures and artwork, and you can watch the artisans at work. Stop along the way and chat with a painter or potter, or let a broom maker show you how it’s done. Once the sun sets, there’s plenty of dining and entertainment downtown. From family fare to filet mignon, Gatlinburg’s restaurants are always fixin’ up something special. After dinner, enjoy a show. Take a trip back in time to the slapstick vaudeville comedy of Sweet Fanny Adams Theatre or check out the Mentalist show with hypnosis and magic. Grab a bench and people-watch. Or cruise up the Space Needle or Gatlinburg Sky Lift and enjoy the twinkling lights below. WITNESS THE WILDERNESS This is one of the last remaining big chunks of wilderness in the East. Get away from civilization in more than 800 square miles of tranquility, with old-growth forests, clear streams, meandering trails, wildflowers, and panoramic vistas from mile-high mountains. GET YOUR ENDORPHINS GOING Outdoor junkies can bike, boat, camp, fish, hike, ride horses, white-water raft, watch birds and wildlife, and even cross-country ski. EXPERIENCE MOUNTAIN CULTURE Visit restored mountain cabins and tour “ghost towns” in the park, with old frame and log buildings preserved much as they were 100 years ago. SPOT WILDLIFE Biologists estimate there are more than 1,500 bears, 6,000 deer, and more than 150 elk now in the park, so your chances of seeing these beautiful wild creatures are quite good. LEARN SOMETHING NEW Take advantage of the interpretative talks and walks. Creekstone Inn is one of the friendliest Pigeon Forge hotels. Their emphasis on hospitality is family tradition proudly maintained by our front desk, housekeeping, maintenance, and management staff. 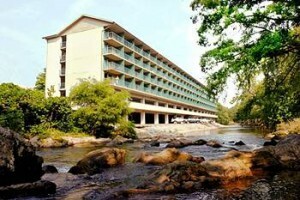 One of the best placed Pigeon Forge hotels, Creekstone Inn sits on the edge of the Little Pigeon River. Every guest room features a balcony overlooking the river, providing a peaceful respite right in the heart of the city. * Pool (seasonal – open from 8am to 10pm). * Express Continental Breakfast served daily on the second floor. * River Tubing (seasonal). Guests of Creekstone Inn are welcome to sign out inflated tubes for use in the river behind the hotel. There is no fee. * Ducks – Creekstone Inn is often visited by ducks, geese, squirrels, and other “nature friends”. * Balcony overlooking the Little Pigeon River. * All rooms are non-smoking, non-pet. * Two televisions (one flat screen) with cable/free HBO. * Split design – bathroom in middle of guest room. Eagles Ridge Resorts’ cabin rentals and chalet rentals offer all amenities including fireplace, whirlpool, hot tub, fully-equipped kitchen. One to nine bedrooms are perfect for a honeymoon, family vacation or reunion, romantic getaway, church group, or corporate retreat. Located only a few minutes from the Great Smoky Mountains National Park!